Why did we design Total Protein? Protein is an integral macronutrient within your body. Regular consumption of protein (every 3-4 hours) throughout the day can become challenging with the hectic lifestyles one can face. 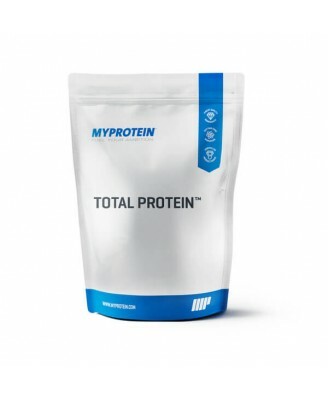 That's why we have raised the bar once again with this new and exclusive reformulation of Total Protein, an innovative powder to provide an unparalleled supply of protein throughout the day. How did we reformulate Total Protein? This brand new and exciting reformulation incorporates 7 different types of protein (Whey Protein Concentrate, Whey Protein Isolate, Hydrolysed Whey, Milk Protein, Micellar Casein, Calcium Caseinate and Free Range Egg White Powder) to ensure you receive a constant supply of amino acids throughout the day. This improved formula is low in sugar and only provides 2g of carbohydrates per 30g serving, ensuring all your strenuous workouts and strict nutrition are not sabotaged with additional calories and sugars. Now available in our unflavoured powder option or one of the following 5 exciting flavours: Strawberry Cream, Chocolate Smooth, Vanilla, Chocolate mint and Natural Banana. The high protein content of each serving (25). A balanced mixture of both fast and slow digested proteins ensures this product can be used anytime throughout the day as well as at night-time. A nutritional profile that you will find hard to beat, being low in sugar and containing an impressive 118kcal per serving. Unrivalled taste, texture and value for money. 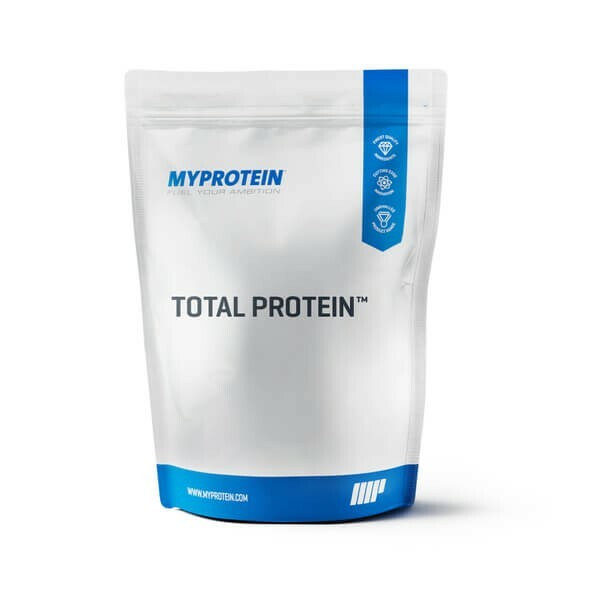 Total Protein is an excellent choice of protein for males and females looking to meet their individual daily protein requirements. In every sport, from Yoga to Bodybuilding, your muscles need a constant supply of proteins to recover and adapt so you can keep pushing beyond your boundaries session after session. When should I consume Total Protein? We recommend consuming Total Protein first thing in the morning to fuel your day or pre/post training to support recovery. Due to some proteins within this powder being slowly digested, such as Micellar Casein, this product can also be used as a pre-bed supplement to ensure your muscles are in safe hands during periods of sleep. You can consume Total Protein with water or milk as a refreshing and replenishing protein shake, or combined with your favourite smoothie recipes, porridges and Greek yoghurts. Add 1 large scoop (30g) to 250-300ml of water or milk in a Myprotein shaker first thing in the morning or 30 minutes before and/or after your workout for maximum benefits. Alternatively, add to smoothies, porridge or Greek Yoghurts.